SCARF COLLAR DOUBLE TAILS. DARK BROWN. LENGTH: 50". 49" scarf end to end and a width of 17 1/2". Total length with fringe end to end is 55". Wash as silk. wash as silk. SAGA REAL BLONDE MINK FUR STOLE. IT IS MADE OUT OF LUXURIOUS REAL MINK FUR THAT IS A CREAMY IVORY COLOUR. THE STOLE HAS DEEP COLLAR THAT CAN SIT UP. A TRULY BEAUTIFUL STOLE AND ALL HAND MADE. WHICH WOULD ENABLE YOU TO ATTACHED STOLE TO A COAT OR JACKET. Quite Gorgeous Silver coloured Stole/Wrap. Made in 1960s/1970. once only; don't get out much!). as new condition (worn. Beautiful gauze stole in green with red, pink & purple machine embroidered roses with black leaves. In the centre/back of the wrap are woven stripes. A truly stunning item with a black silk?. Genuine 1940’s mink scarf, has pockets! Slight damage to the centre due to age but due is in immaculate condition. Passed down from my grandmother but should go to a good home! A STUNNING SCARF OR STOLE FOR THE SPECIAL EVENING. THE CHIFFON IS DOUBLE THICKNESS. SHAWL EMBROIDERED. FOR EVENING WEAR. A LOVELY UNUSUAL TASSLED SCARF FOR EVENING WEAR.OVER A DRESS. LOOKS EMBROIDERED WITH THREADS,LOVELY VIBRANT COLOURS. Fabric : Polyester (floaty & semi-sheer). It has the beautiful sheen that's attributed to mink. Fabric : 20% Silk, 80% Viscose (floaty & semi-sheer). Small Beautiful hand crochet knit triangle shawl in pink blue yellow green and white stripe with tassels Original vintage In excellent condition. Measures 50 " wide X 27 " deep at centre point Inc tassels. Freshly laundered. Could be used as a small scarf shawl or baby shawl also for a child. Very petty Any questions please feel free to contact me. Length 46" not inc fringe width 11 1/2". Shawl two is atriangular black fringed shawl. Shawl three is a Black fringed shawl, glitter thread detail through out. For sale are three black shawls ideal for that travel to a party or a wedding to keep chill from arms. 4" X 2.25" UP TO 16.5" NECK. All photos of an actual item for sale. colour also depend on setting of your monitor. Stunning quality, rich glossy & beautiful mahogany brown fur, fully detachable tails. with simple press studs, backed with a s ilky chocolate brown lining -. all ready to wear straight away! This is a beautiful Musquash fur shoulder cape with well matched pelts creating a striped effect running from neckline to hemline. It has a shawl style collar that sits comfortably around the neck or could be worn up to keep out unexpected draughts. 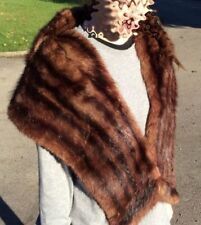 Genuine 1950’s Vintage Real Fur Stole Wrap. Condition is Used. Dispatched with Royal Mail 1st Class. Ladies scarf/shawl in peach orange tan brown & white. Lots of interesting little pictures on it, including umbrellas, fans gloves, hats & handbags. 70cm square with rolled edges. There isn't any label clarifying what material the scarf is, although I think it is silk. Tootal Scarf. Tootal Scarf regd. Red with a light polkadot 3" red fringe either end. 48" scarf end to end and a width of 11". Total length with fringe end to end is 54". I bought this shawl during the very early 1960's for a formal "do". 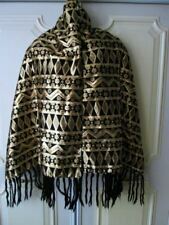 Black Chiffon Style / Semi Sheer Spanish Style Embroidered Fringed XL Scarf / Wrap / Shawl. WILL be individually & gently hand washed to freshen, then air dried. Your item will be washed, regardless of wash-care label & responsibility for shrinkage / colour bleed / deterioration etc is not accepted once sold. 1990's Evening Stole. Item is a shade darker than pic due to flash. Never worn been folded up in the closet for over 20 years. Luxurious real knitted mink women's fur shawl. Luxurious real knitted Mink fur shawl with leather drawstring. One size fits all. 'TORRENTE' 70'S FRENCH VINTAGE LONG PRINT SCARF 54" x 10"
This 70's long print scarf is from the 'Torrente - Paris' couture label. This scarf is rated as being in good condition. Salmon colour. approx - 68" long. This is lovely fur but I have no idea what kind it is. Mink maybe. Probably best as a collar to add to a coat but I wore it as a stole. Stitching send a little loose at the top of the two pieces (see photos), easily rectified. Beautiful golden island type fox fur. Fur collar used not much and in a very good condition good to use for many more years. Fur collar goes without lining so it is great and easy to attach on your favorite coat or jacket and you are ready to go. 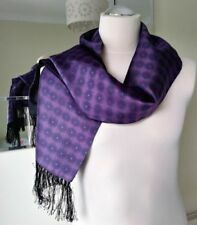 Stunning Vintage 1980's City International Silk Mix Devore Scarf/Shawl/Wrap. The fabric is 40% silk 60% viscose. "Dry Clean Only". Marabou feathers are characterized by their very fine, dense, downy and very fluffy short nap (length), and are velvety soft". I wondered if it was to allow it to fall on to an arm to carry when not being worn as they would in the 1920's. Fabulous VINTAGE SILVER FOX REAL FUR COLLAR WRAP SHAWL CAPE SCARF STOLE One small repair needed if required (see last photo) top mid back of stole. Lining in excellent condition. In good condition for age! The stole is gorgeously soft and luxurious, and very long too! It is Bespoke Hand-Made, lined with silk and all hand stitched. The stole is not only lovely and long, but nice and wide too, making it very versatile and allowing it to be worn in a number of ways. Turquoise Blue, Pearl and Silver.